Below is a list of all of the writings of Octavius Winslow I was able to discover throughout the internet. I say “writings” because while most of these are actually books, there are some sermons and co-authors he preached and wrote scattered throughout. While I cannot prove it, I believe this list is the most thorough compilation of Winslow’s works currently available. The following book summaries located below each title are used with the permission of Tanner Turley who has written the most detailed work to date concerning the homiletics of Winslow. Tanner is currently seeking to have that work published. I have also learned that there are many unpublished sermons and a few personal papers of Winslow’s that are locked away in the British Library archive. It is my hope to someday get these unpublished sermons scanned that I might share them here. Also, an extra special thanks to the people at Grace Gems for assembling many of the works of Winslow in digital format. If you have any works you would like to add, please contact me and we will get it added to the list. To see the photo set of pictures that I took on a trip to the special editions collection at the Princeton Theological Seminary library, click here. London: John F. Shaw, 1870. 16pp. This is a book comprised of thirty short chapters which focus the reader on various aspects of the person and work of Christ. Each chapter serves as a meditation on a particular facet of Christ‘s life. Examples of some chapter titles include: Consider Jesus—in Lowliness of Birth; Consider Jesus—the Object of Popular Hate; Consider Jesus—Without Deceit; Consider Jesus—as Receiving Sinners; and Consider Jesus—in His Atoning Blood. As typical of Winslow‘s writings, he demonstrates how each truth concerning Jesus matters for the life of the believer. DeVries. Grand Rapids: Reformation Heritage, 2003. 788pp. These thoughts were selected by Winslow himself from his writings. Unlike other daily devotionals, such as William Jay’s, these daily portions elucidate only one or two thoughts from the day’s text rather than providing a comprehensive view. The advantage of this approach is that the selections are deep, heart-warming, and inspirational—just what is needed to offer a Christ-centered beginning to each day. As is true of all of Winslow’s writings, these volumes are a gem. Representing devotional writing at its finest, it is replete with memorable statements for spiritual edification. Use these books to treasure those sacred truths of Scripture that will mold your thoughts, words, and actions of Christian living. Also, check out Tony Reinke’s excellent review of this devotional classic here. London: James Nisbet & Co., 1860. Repr., Ligonier, Pa.: Soli Deo Gloria, 1993. 424pp. You can also check out Tony Reinke’s terrific review here. London: John F. Shaw, 1864. 299pp. In this book, Winslow articulates his doctrine of regeneration. Amidst the swirling controversy over baptismal regeneration (which Winslow clearly denounced), Winslow feared that the doctrine was handled with “levity” for those who lost sight of its doctrinal and experimental importance. One of his key arguments throughout the work is that “the Holy Spirit must be [the] Divine and sole Author [of salvation], from its commencement in grace to its consummation in glory.” He first sets forth what does not constitute real conversion. He then explains the true characteristics of regeneration. The evidences and fruits of regeneration are also considered followed by various aspects of sanctification that are related to the believer‘s conversion. Some of those include assurance of conversion, anxiety about conversion, and the believer‘s final transition from a state of grace to a state of glory. Concerning grace in the soul he wrote, “the grace of God in the soul was the pledge of its coming glory. It is indeed more than the pledge, it is essentially and undeniably a part of the glory itself. Present grace is to future glory what the outline is to the picture, the seed to the flower, the twilight to the day. He who has the smallest degree of grace in his soul has the first beginnings of glory.” In this way, he provides a holistic picture of the doctrine. London: John F. Shaw, 1869. No pages numbers. Philadelphia: Lindsay & Blakiston, 1856. 273pp. “Glimpses of the Truth as it is in Jesus” is a series of sermons that Winslow delivered on a trip to Scotland. He wrote in the preface, “It is proper briefly to allude to the history of this work. Scotland is its birth-place. It contains the substance of a few discourses which the author delivered from the pulpit of different Christian denominations, during a recent visit to that magnificent and interesting land.” These sermons cover a range of topics but have several sections that specifically address the Christian minister. His sermons on “The Pastor‘s Request for Prayer” and “Voice of the Charmer” serve as great examples. Moreover, his sermon from Jer 2:13 on “Broken Cisterns” is an excellent account of the satisfaction that is found in Christ alone in comparison with the worthlessness of idolatry. These sermons are very devotional and practical in nature but do not neglect deep theological reflection on the doctrinal content of the text under consideration. As is true of all of Winslow’s writings, this volume is replete with memorable statements and written for spiritual edification. This book provides invaluable help to Christians on their way to heaven. Chapter 1 presents the Christian as someone on the way home to heaven. Chapter 2 deals with the critical, yet sorely neglected, theme of progressive sanctification, steering between denial and exaggeration of that process. Winslow focuses in chapter 3 on “the gentleness of Christ,” showing how Christ leads burdened believers onward and calls them to imitate that spirit. Every cloud in the believer’s life is Christ’s chariot to lead him to glory, Chapter 4 teaches. Chapter 5 shows that trials promote spiritual instruction, prayer, spirituality, moral purity – all of which prepare the Christian for heaven. Chapter 6 shows that as the believer progresses to his eternal home, Christ loosens his bonds, delivering him from the world and Satan, providing him with the Spirit’s seal of adoption, and working evangelical obedience in him. Chapter 7 shows how the believer transfers all his cares to God, including mental anxiety, depression, and difficulty in discerning God’s will. In the next chapter Winslow explains how self-examination, when properly undertaken, can aid us in our journey to heaven. In chapter 9 he urges God’s children to repent of all backsliding, and in chapter 10 he provides directions on how to face death. The book concludes by ushering the believer into his Father’s house. “Help Heavenward”, a practical handbook on sanctification with heaven ever in view, is devotional writing at its finest. I know of no better book to give to Christians as they struggle in this sinful world to live in obedience to their Savior. Use this book to become acquainted with those sacred truths of Scripture that the Spirit uses to mold our thoughts, words, and actions for Christ-like living. London: John F. Shaw, 1876. Repr., Spiritual Life: Soul Depths and Soul Heights and Lights and Shadows of Spiritual Life. Stoke-on-Trent: Tentmaker, 1998. 95pp. “No Condemnation in Christ Jesus” is a compilation of Winslow‘s sermons on Romans eight. The preface reveals that he abridged these messages which were “originally delivered by the Author in the course of his stated ministrations, and in his usual extemporaneous mode of address.” Winslow called Romans eight “a mine of sacred wealth, as inexhaustible in its resources, as those resources are indescribable in their beauty, and in their excellence and worth, priceless.” He went on to say, “It would, perhaps, be impossible to select from the Bible a single chapter in which were crowded so much sublime, evangelical, and sanctifying truth as this eighth of Romans. It is not only all gospel, but it may be said to contain the whole gospel.” Each of the chapters unveiled the doctrinal truth contained in Romans eight verse by verse and phrase by phrase. Winslow was careful throughout to show the experimental relevance of the truth for the daily lives of his readers. New York: Anson D. F. Randolph, 1863. 90pp. Winslow wrote “None Like Chris”t as a reflection for the New Year in 1860. This short booklet is the length of one of his sermons and is a meditation on Song of Solomon 5:9, “How is your beloved better than others?” His purpose in writing is to present Christ “as worthy of your undivided affection, supreme confidence, and unreserved service, infinitely distancing and eclipsing all other beings and all other objects brought in competition with him.” After considering some of the rivals of Christ in the heart of man (self, the world, the creature), Winslow expounds the worth of Christ in light of his glory, beauty, love, as our Savior, Teacher, Friend, and Servant. He concludes with a few practical exhortations to stand firm, to be faithful to His Word, and to be spiritually minded. John F. Shaw, 1870. Repr., Grand Rapids: Reformation Heritage, 2007. 164pp. “Our God” is Winslow‘s devotional treatment of some of the moral perfections of God. In the preface to the work, he encouraged his readers to personally apply the doctrines, precepts and promises of God‘s Word. He wrote, “The design of these pages is to raise the believer to this elevated and proper standard in his personal religion.” The ten chapters address such themes as God‘s love, patience, comfort, grace, holiness, and peace. His insights concerning the relationship between the patience of God and the mercy of God help demonstrate how all of God‘s moral perfections unfold the beauty of the gospel. He explained, “The patience of God seems like a central link in this golden chain of attributes. Mercy would have no room to act if patience did not prepare the way, and His truth and goodness in the promise of the Redeemer would not have been made manifest to the world if He had shot His arrows as soon as men committed these sins and deserved His punishment.” Throughout the work Winslow demonstrated how the character of God should influence the daily life of his people. London: John F. Shaw, 1873. 212pp. Winslow stated the purpose of “Pisgah Views” in the preface when he wrote, “The design of this little work is to serve a twofold, soul-animating, purpose—as a staff, aiding faith’s ascent of the glorious height of Pisgah; and then, from its summit—as a telescope, bringing nearer to its sanctifying and comforting view those sublime beauties and winning attractions of the land which is very far off,‘ and which, in our present imperfect state, are best understood and felt in their shadowy and negative forms.” When Winslow spoke of the negative forms or views of heaven, he meant the negative descriptions of what heaven is like given in Scripture. His chapters address truths such as the abolition of the curse, hunger, pain, tears, and death. London: John F. Shaw, 1874. Repr., Carlisle, Pa.: Banner of Truth, 2006. 135pp. “Soul Depths & Soul Heights” are a series of expositions on Psalm 130 delivered during his weekly pulpit ministry. Winslow calls Psalm 130 a “Christ-unfolding Psalm.” He takes the chapter verse by verse and expounds the doctrine of the verse in each sermon. He preaches Christ in various ways, sometimes in the instruction of the text, sometimes in the application, and sometimes as the theological fulfillment of the text. In addition to the Christ-centered nature of his exposition, two other qualities stand out. First, the exhortative nature of his preaching is interspersed throughout. He consistently encourages his hearers to put the truth into practice. Another prominent feature of his preaching involves how he concludes most of his sermons with an eschatological thrust. No matter what topic his sermon expounded he almost always demonstrated how it should be viewed in its cosmic scope and with a view to our future hope with Christ in the new creation. This feature is representative of the biblical theology that pervades his preaching and writing ministry. London: James Nisbet, 1864. Repr., Stoke-on-Trent, UK: Tentmaker, 1998. 162pp. Winslow offered this meditation to the church on a theme that he believed, “all vital, saving truth centers in, and all sanctifying and comforting blessing springs from.” He called the cross of Christ “a theme which the combined intellect of heaven could not fully unfold, nor the study and contemplation of eternity utterly exhaust.” He covered a range of topics related to the believer living under the shadow of the cross of Christ. Those topics included personal holiness, prayer, love, forgiveness, conviction of truth, the unity of the church, and the believer‘s own crucifixion with Christ at the cross. One of the most intriguing chapters addresses “The Cross of Christ the Christian‘s Weapon”, Winslow referred to the blood of Jesus as the weapon that “is to vanquish and overcome all the spiritual opposition by which our path to heaven is intercepted.” This book is yet another volume in Winslow‘s library that displays the work of his gospel-centered and Christ-exalting pen. This is Octavius Winslow’s devotional treatment of the fascinating history of Joseph and his brothers. Winslow is peculiarly gifted at drawing our minds and hearts toward the Greater Joseph and His brethren. His chapters on Christ revealing Himself to His people, Christ as our brother, and the glory of Christ in heaven are alone worth the price of the book. London: John F. Shaw, 1841. Repr., Carlisle, Pa.: Banner of Truth, 2000. 203pp. This work addresses the life of God in the soul of man. His concern is the church‘s progress in sanctification. The key question Winslow puts before his readers is: “What is the present spiritual state of my soul before God? ” He examines how the believer‘s devotion to Christ often declines and what they can do to seek its revival. Specifically, he addresses the believer‘s love, faith, prayer, and doctrinal precision. He also has chapters on grieving the Spirit, the fruitless and fruitful professor, and the Lord as the restorer and keeper of his people. In each chapter, Winslow explains various causes of declension and prescribes remedies as to how one can be restored. His prescriptions are always God-centered and deal much with the atoning work of Christ on the cross. This work highlights the need for self-examination and grace-motivated obedience. His chapter on doctrinal error is very well done speaking to the inextricable relationship between one‘s doctrine and life. This book provides the church with a great resource on discipleship. Experimental and Practical View; Carlisle, Pa.: Banner of Truth, 2003. 223pp. Winslow was ever interested in theology that touches life. He believed that doctrine matters for everyday living. He was after experimental religion. This writing on the Holy Spirit supplies a striking example of his aim as a pastor and writer. He explained, “To impress the mind more deeply with the glory of His person and with the necessity and value of His work, and to awaken a more ardent desire and more earnest and constant prayer for a greater manifestation of His influence, and a more undoubted evidence of His glory and power in the church and in the believer, are the object of the writer in the following treatise.” After arguing for the deity of the Spirit in chapter one, Winslow spends the next two chapters on the regenerating work of the Spirit. He moves on to cover the indwelling of the Spirit, the Spirit‘s work of sanctification, and the sealing and witness of the Spirit. He concludes his work by examining the Spirit as the author of prayer and the Spirit as a comforter. Winslow relies on Scripture to make his case throughout the work and he accomplishes his purpose of providing an experimental and practical view of the Spirit‘s work. London: John F. Shaw, 1850 308pp. Winslow was a pastor who was deeply concerned about the spirituality of the church. He described the impetus for writing in one of the most extensive explanations found in any of his works. He wrote, “The subject of this work suggested itself to the author’s mind during a visit to the metropolis“.His close communion, at that time, with what is called the “religious world”, forced upon his mind the painful conviction, that while religious profession was greatly on the increase—and never more so in the higher classes of society than at the present—vital godliness was in proportion on the decline; that while—to speak commercially—the quantity of religion was increasing, its quality was deteriorating. The vast number whose Christian profession was avowed—whose religious character was recognized—whose theological creed was sound—whose conversation was pious—whose sacred observances were rigid—whose benevolence was applauded—whose zeal was admired—who prided themselves upon their eloquent preacher, and their favorite religious author; but who yet were living in the world, and living as the world, and living to the world—deeply and painfully saddened him. The question frequently arose in his mind—”Where is the salt? Where are the really living souls? Where are those who know what true conversion is? Who are following Christ, and are living for God? Where are the possessors of the true spiritual life? Alas! the world has become so like the Church, and the Church so closely resembles the world; the one so religious, and the other so carnal; an unskilled eye may be deceived in searching for the essential points of difference. Nor this alone. Even among those in whose souls it would be wrong, no, impossible, to deny the existence of spiritual life, how few are found who really seem for themselves to know it!” On his return to his flock, the author—in his usual extemporary mode of address—unburdened his mind from the pulpit. The result, in a calmly written and greatly amplified form, is now, with lowliness and prayer, presented to the public. Thus, Winslow set out to unfold the nature, relapse, and recover of the spiritual life in the soul of the believer. London: John F. Shaw, 1866. Repr., Stoke-on-Trent, UK: Tentmaker Publications, 2003. 217pp. Winslow‘s penned The Lord’s Prayer, which he would prefer call The Disciples‘ Prayer, in order to set forth the spirit of the prayer. Thus, in each of the twelve chapters he takes a word or phrase of the prayer and expounds the meaning and significance. He unpacks the filial (Father), the catholic (Our), the celestial (Which art heaven), the reverential (Hallowed be Thy Name), the prophetical (Thy kingdom come), the submissive (Thy will be done on earth as it is done in heaven), the dependent (Give us this day our daily bread), the penitential (Forgive us our debts), the forgiving (As we forgive our debtors), the watchful (Lead us not into temptation), the devotional (But deliver us from evil), and the adoring (For thine is the kingdom, and the power, and the glory, for ever and ever. Amen) spirit of the prayer. London: John F. Shaw, 1865. 283pp. Winslow observed that it is difficult for the church to grow both wide and deep. He penned “The Man of God” in order to set forth the deep spirituality that should be present in maturing disciples of Christ. He said that his work seeks “to portray the man of God in some of the essential and prominent features of his holy character, and to trace a few of the stages of his Christian experience; making the Lord Jesus Christ—the Divine Man—the central object of the picture.” Throughout the twenty chapters of the work, Winslow explains various aspects and fruit of sanctification such as: the believer‘s joy, confessing and forsaking sin, awaiting the Lord‘s return, and integrity. London: William Hunt & Co., 1868. 359pp. 26) THE NIGHTINGALE SONG OF DAVID: A Spiritual and Practical Exposition of the Twenty–Third Psalm. London: John F. Shaw, 1876. 176pp. Winslow opened this work with a defense of the inspiration of Scripture and more specifically, the Psalter by pointing to 2 Samuel 23:1–2 which speaks of the Spirit speaking through David. This is important due to the intense skepticism and attack on the inspiration of Scripture during the latter days of Winslow‘s life. He called the twenty–third Psalm “the divinest, richest, and most musical of all the songs which breathed from David‘s inspired harp.” Winslow believed that Psalm 23 “begins with Christ and ends with heaven.” The eleven chapters of exposition work phrase by phrase through the Psalm and uncover the various doctrinal and practical themes. New York: Robert Carter & Brothers. Repr., Harrisionburg, Va.: Sprinkle, 1994. 426pp. “The Sympathy of Christ with Man” provides another example of Winslow‘s commitment to experimental Christianity. Winslow‘s purpose is observed when he wrote, “One, and the chief, design of this volume is to exhibit and illustrate the practical character of our Lord‘s emotional nature—thus linking Him in closer and personal actuality with our circumstances.” This work emphasizes the humanity of Christ while not neglecting his divinity. It covers topics such as the tears of Christ, his anger, his love, his sensitivity to suffering, and his sympathy with temptation. Throughout Winslow exposes the relevance of Christology for the Christian life. London: John F. Shaw, 1868. 320pp. “The Tree of Life” is yet another book centered on the person of Christ. More specifically, this work emphasizes several incidents from his life demonstrating how it “was a pre-eminently a practical life.” A few of the events examined include the episode of Jesus as a child in the temple, his tears at the grave of Lazarus, the washing of the disciples‘ feet, his crucifixion and resurrection, and his appearing to Paul on the Damascus road. The book serves as an example of Winslow‘s dual purpose of edifying believers while not neglecting his responsibilities as an evangelist. Of the latter he wrote, “It has been the aim of the author of the present volume so to unfold the way of life‘ that each chapter should contain an epitome of the gospel plan of salvation. It may thus be found an appropriate work to place in the hands of those alas! how countless the number!—who are living in blinded ignorance or in criminal neglect of the claims of God, the interests of their soul, and the solemnities of eternity.” This work supplies a rich depository of Christological truth. London: John F. Shaw, 1860. 266pp. “Divine Realities” is a compilation of some previously published writings of Winslow that were penned for the beginning of a new year. The eight chapters are divided equally between four Old Testament meditations and four New Testament meditations, revealing Winslow‘s balanced exposition of the whole counsel of God. Two of his previously published tracts included are “My Times in God‘s Hands,” which highlights the sovereignty and loving protection of God throughout all of life, and “Go and Tell Jesus,” which exhorts readers in their communion with Christ. London: John F. Shaw, 1865. Repr., Pittsburgh: Soli Deo Gloria, 1997. 413pp. Winslow wrote this treatise to present “in an experimental and practical light, a view of the personal and official glory of the Redeemer.” He spoke of his purpose when he wrote, “To aid the spiritual mind in its endeavors to obtain an occasional sight of the Redeemer‘s glory, in the vale of darkness and of tears, is the simple design of this work.” Ten chapters comprise this lengthy work covering a wide range of topics. Winslow opened the work by unfolding the pre-existent glory of Christ and how Christ reveals the Father‘s glory. His Christocentric hermeneutic surfaced throughout the work, particularly in chapters three and four where he addressed the typical and prophetical glory of Christ. He also covered some of the major events of the life of Christ devoting chapters to his humiliation, resurrection, and ascension and exaltation. The final three chapters declare Christ‘s glory in his people, the Holy Spirit‘s glorifying the Redeemer, and the second coming of Christ. London: John F. Shaw, 1856. Repr., Stoke-on-Trent, UK: Tentmaker, 1998. 123pp. London: John F. Shaw 1872. 214pp. Winslow first penned this book shortly after his son Whitmore accidentally drowned while bathing at sea in 1856. He described his son‘s death as a “sudden shock and convulsed agony.” Winslow includes many journal extracts from Whitmore and describes his short life of twenty-one years. Whitmore was a believer. In fact, he was converted under his father‘s ministry and had planned to go into the ministry after college. London: John F. Shaw, 1890. Repr., Carlisle, Pa.: Soli Deo Gloria, 1993. 339pp. Life in Jesus was written by a son who desired to bless the church with a memoir of his godly mother. Octavius believed it would be a disservice to neglect perpetuating the legacy of his mother, Mary Winslow, whose life was “too interesting and instructive to be altogether lost.” This memoir traces her life as chronologically as possible from birth to death by relying on her personal correspondence and journal entries. The book not only tells of this godly woman who dedicated her life and family to the Lord, but also provides insight into the life of Octavius. This work is particularly important for researchers of Winslow since he never had a biographer in his day. London: John F. Shaw, 1863. Repr., Grand Rapids: Sovereign Grace Treasures, 2005. 263pp. “Patriarchal Shadows” is a compilation of sermons delivered extemporaneously by Winslow which were recorded by a stenographer. In this series of expositions from Genesis, he unpacks the narrative detailing the lives of Joseph and his brothers. While Winslow does not totally disregard the original context of the narrative, his main purpose is to unfold the shadows of Christ in the narrative. The opening words of his first sermon reveal his Christocentric hermeneutic: “The Word of God is as a garden of fruit and flowers–luscious with the sweetness, penciled with the beauty, and fragrant with the perfume of–Christ. All its shadows, types, and prophecies, all its doctrines, precepts, and promises testify of Him. Search the Scriptures in whatever part, or view them from whatever standpoint you may, of Christ they speak and to Christ they lead.” He faithfully employs typological interpretation in many cases, but at times crosses over into spiritualizing the text as he presents Christ as our true and spiritual Joseph. London: John F. Shaw, 1872. No page numbers. This work provides its readers with thirty–one devotional reflections from God‘s Word. Winslow penned the purpose of the work when he wrote, “It is intended to be a faint echo of God‘s words of divine love addressed from time to time to His people, amid the varied experiences, duties, and trials of their Christian course.” The title of this work is even more significant when one understands the cultural and ecclesiastical context in which Winslow ministered. He explained, “Never was there a period when we had greater need to keep close to the, Thus saith the Lord,‘ than the present! The Word of God is assailed by avowed foe and by sworn friend. Its most subtle and dangerous enemies are among its professed and sworn friends.” Winslow‘s meditation on scriptural truth demonstrates his conviction that adherence to God‘s Word makes Christians and nations great. New York: John S. Taylor, 1838. 124pp. “Christ, the Theme of the Home Missionary” was one of Winslow‘s first publications. The substance of this short book was originally delivered from the pulpit. It was subsequently sent to the press for publication at the request of some who heard Winslow‘s sermon. Winslow took Paul‘s words in Phil 1:18 as his sermon text: “Christ is preached; and therein I do rejoice, yea, and will rejoice.” Winslow outlined his message with four movements. First, he argued that the design of the home mission enterprise aims at the salvation of men. Second, he declared that the grand instrument of home mission success is the preaching of Christ. Third, he provided arguments by which churches should support home missions. Finally, he addressed the motives that might move churches to give to the Home Mission Society. This work reveals the importance Winslow placed on mission work in his ministry. London: John F. Shaw, 1864. 169pp. This is a republication of two books previously published separately as “The Atonement” and “The Foot of the Cross”. 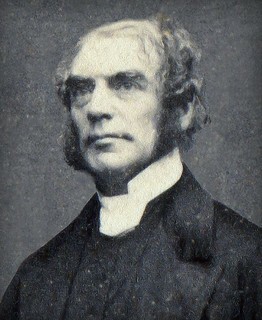 Octavius Winslow, who ministered during the 19th century in England, has seldom been equaled as a writer on the devotional aspects of Christianity. His works are marked by a profound grasp of theology combined with heart-searching application. In this he follows in the line of the Puritans and yet his style is more accessible to the modern reader. London: John F. Shaw, 1864. Repr., Grand Rapids: Reformation Heritage, 2001. 344pp. In Heaven Opened, Winslow compiled some personal correspondence of his mother Mary. One of her gifts was encouraging and instructing through the many letters that she wrote to friends and those who needed her special care. In the preface, Winslow spoke of his mother, “Heavenly-mindedness,—the highest order of spiritual-mindedness—seemed to individualise Mrs. Winslow‘s Christianity.” These letters could be read as daily devotionals. 49) CHRIST AND THE CHRISTIAN IN TEMPTATION: Counsel and Consolation for the Tempted. London: John F. Shaw, 1878. 168pp. In Puritan fashion, this book serves as a meditation on Heb 4:15. Winslow explained, “Acceding—as we are bound—to the inspired declaration that our Lord was “tempted in all points like as we are,” it follows that there must exist a corresponding coincidence in the collision of Christ with Satan, and the spiritual conflict in which every good man is engaged of the same nature and with the same foe.” Throughout the first six chapters Winslow unpacks Heb 4:15 by giving an exposition of Christ‘s temptation in the wilderness (Luke 4). He looks at how Christ was and the Christian is tempted to 1) distrust divine providence; 2) self-destruction; 3) false and idolatrous worship; and 4) with worldly grandeur and possession. He then turns to Hebrews 2 and encourages the reader with the sympathy of Christ in our temptation. Finally, Winslow closes his book with a triumphant tone as he describes the final overthrow of the Tempter and his works by Jesus. London: Houlston & Stoneman, 1843. 88pp. London: W. Hunt, 1868. 500pp. Winslow selected and complied these hymns for use at his new pastorate, Emmanuel Church in Brighton. London: John F. Shaw, 1867. 80pp. Winslow delivered this New Year‘s address roughly two months after his wife Hannah Ann died suddenly at their home. After providing a lengthy doctrinal exposition of 1 Thess 5:17, he provided a short biographical sketch of his wife. This is valuable for studies on Winslow because so little is known about Hannah Ann. He told the story of her conversion and the final moments he was able to spend with her. Winslow also took the opportunity to praise God for his work in her life and through her personal ministry to him, the family, and others in the church and community. London: John F. Shaw, 1858. 94pp. This work constitutes a plea for revival among British churches. Winslow makes a clear call for seeking the Spirit‘s divine blessing for the church‘s witness. It reveals his passion for souls and his deep convictions concerning the person and work of the Holy Spirit. His goal in writing is revealed when he wrote: “There being, then, no straitness in the Spirit, other than that which His own sovereign will imposes, why should we not look for such an extensive Revival of Religion, such a National Baptism of the Spirit, as that which at this moment prevails in the United States?.” After unpacking a practical theology of the Holy Spirit, he then went on to give his readers extensive examples of how revival was breaking out in the United States. 54) JESUS AND JOHN: The Loving and the Loved:, A Tribute to the Memory of the Late Rev. William Marsh, D.D. London: James Nisbet & Co., 1859. 39pp. Winslow delivered this sermon as a tribute to one of his Anglican brothers, Rev. William Marsh, who had recently passed away. He memorialized his life by meditating on the beloved disciple John. Winslow explained, “In searching for a Scripture portrait illustrative of the character of my departed friend, not one struck me as presenting so true and perfect a resemblance as that of =the disciple whom Jesus loved.” After explaining the love of Christ, Winslow reflected on the character, convictions, and ministerial influence that Rev. Marsh exercised throughout his life. This sermon provides an example of the friendship Winslow enjoyed with other ministers. 55) MIDNIGHT HARMONIES: Thoughts for the Season of Solitude and Sorrow. New York: Robert Carter & Brothers, 1853. 249pp. The origin of this work was the “sudden and alarming illness of a beloved relative.” The dedication reveals that the beloved relative was his sister. Winslow explained his distress writing, “A period of much anxiety ensued, during which the idea and the themes of this little volume suggested themselves to his mind.” He composed Midnight Harmonies “at intervals between a sick chamber and the study” for “those who may be passing through a season of anxiety and trial.” Written with the goal of comforting those in trial, the chapters highlight God‘s sovereignty in trials and the help that he gives to his children. In typical fashion, Winslow‘s work is very Christ-centered with chapters entitled: “Jesus Veiling His Dealings”, “A Look From Christ”, “Looking Unto Jesus”, and “Jesus Only”. 56) THE MINISTER’S FINAL CHARGE: A Discourse, Delivered on Relinquishing the Pastoral Care, of the Central Baptist Church, New York, December 20, 1835. New York: Leavitt, Lord, & Co., 1836. 32pp. This rare work records Winslow‘s farewell sermon to the first church he pastored, Central Baptist Church in New York, New York. The overarching purpose of this message was to review the most important doctrines he “set distinctly and prominently before them throughout his ministry.” He expounded the doctrines of the original fall and universal depravity of all mankind; the sinner‘s justification through the imputed righteousness of the Lord Jesus Christ; the expiatory nature of the sufferings and death of Christ; the distinct office of the Holy Spirit in the work of regeneration; the coming Savior; and the holiness of the gospel. He also spoke of different ministry endeavors Central Baptist engaged in under his leadership such as Domestic and Foreign Missions, Sabbath School instruction, Ministerial Education, the Bible Society, and the Tract Society. Winslow displayed a warm, pastoral tone in this his final charge to the saints at Central Baptist. 57) THE SILVER TRUMPET: The Church Guided and Warned in Perilous Times. London: John F. Shaw, 1844. 91pp. In a book dedicated to his congregation, Winslow provides an exposition of the gospel with implications for the life of the church. He unfolds the truth of the gospel by unpacking a spiritualized or typological reading of Num 10:1, 2, 5. His purpose is observed when he wrote, “From the various uses of the trumpet among the Jews, we have selected a single one, as affording an illustration, if not a type, of the glorious Gospel of the blessed God, deeply significant and instructive.” After expounding the gospel, Winslow carefully and gently exposes many errors among the Plymouth Brethren and Tractarianism. Winslow‘s grief over false doctrine is evident. He decried, “Oh, it is an awful and a fearful thing to pervert the gospel of Christ! A single error may prove fatal to thousands of souls.”He closes with some practical exhortations to the church concerning the perils of false doctrine and their love for the gospel. London: John F. Shaw, 1858. 13pp. This short letter was a response to a letter sent by an anxious man who was alarmed because he was “on the brink of eternity” and not ready to die. In this letter, Winslow encouraged him to look to Christ and his atoning work for sinners. He spoke directly to him saying, “Again, I repeat, your eye of faith must now be directed entirely out of, and from yourself, to Jesus.” This letter provides an example of how Winslow pled with individuals to be reconciled to God. London: Houlston & Stoneman, 1852. 15pp. What more can I say? Matt, you’ve done a spectacular job with this page! And, special thanks also to Tanner Turley, for all of his efforts. Your site is THE place to go for all things Octavius Winslow. No doubt about it! Thanks for your continuing support you guys! Thanks so very much my soul has ached for my children to know their family all but one are alive. I found my Great Grandmother Mary Winslow if you would like a young picture I have it…. A friend has discovered a copy of an old book entitled “Hidden Life” by John Whitemore (with an e) Winslow published by John F Shaw 27 Southampton Row, London in 1858. Is this an earlier edition of yje one mentioned in No. 34? Any information would be much appreciated. WOAH!Can you please ask your friend to look in the front and check to see if this edition is the second edition run? If it is, that book contains within it the very last sermon Winslow ever preached! I would be VERY VERY interested in speaking with your friend to obtain that book or scans or photos of that last sermon.